Myoshu (myoushu, 妙手), Japanese for "extraordinary", "excellent", "magnificent" move. A move surprising and startling in its insight. Harboring multiple aims in miraculous fashion. 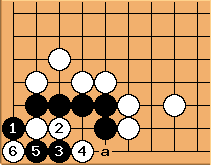 The term should be contrasted with tesuji, a skillful move in a merely local context. Chinese pinyin equivalent is "Miao4 Shou3". In Korean is "myosu". Trying to make every stone a most efficient move would naturally leave some thinness in one's own shapes. When shapes become thin, one has to struggle to save these weak stones. When Sataka is attacked and surrounded by his opponents, he can mostly make alive and escape from the danger. When making alive, ordinary moves do not work easily; one has to deliver severe tesuji or even myoshu. Sakata has made many such moves to save unsavable big teams, and when many people say he's an inventor of myoshu, they are not exaggerating. Professional high-dan players' reading skills are about the same among each other, but the sharpness and accuracy in Sakata's reading makes him the best on this aspect. When people nickname him "Razor Sakata", they are not being unreasonable. He is able to create so many myoshu, is it because the structure of his brain different from others? What exactly is his brain made of? Sakata said, "Among the moves that I've made, there have been some very rare ones that I would consider as myoshu. If everyone regard it as a myoshu, it's then certainly not prepared long ago, but rather, it's discovered during a game. When one gets in trouble or danger, he naturally works harder and ideas come out. I often have such ideas come out when they're needed. This is my strength, and probably my greatest strength. But on the other hand, it's more important to win the game in a simple and easy manner. If one gets in trouble, he would have to work very hard to solve the problems, and to win it this way is tiresome." (Hence, Myoshu will be very often related to shinogi, and you might expect it more often from people who play this style (ed.)). 鬼手, kishu = gǔishǒu, devilish move (tricky, cunning, artful). 妙手, myoushu = miàoshǒu , splendid, brilliant move. 絶妙手, zetsumyooshu = júemiàoshǒu, jue2... , absolutely brilliant move. 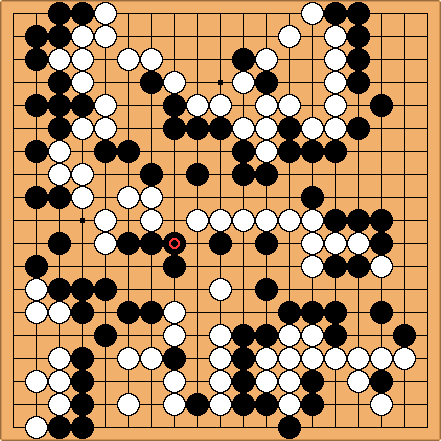 Example 2: BloodVomitingGame: the white moves 5+7 and 7 in diagrams 5 and 6 resp. are as played by Jowa's ghost.